Maharashtra Board SSC Toppers: This year, Around 17.6 lakh students have written the Maharashtra SSC Class 10th examinations through its nine divisional boards from March 1 to March 24 across the state. The Maharashtra State Board of Secondary & Higher Secondary Education, (MSBSHSE), Pune is all set to announce the Maharashtra Board SSC Results 2018 on June 08, 2018. After the declaration of the results, The board will also release the Toppers list of MAH 10th Class Exams. Students can check their MSBSHSE 10th Exam Toppers 2018 details on the board’s official websites — www.mahresult.nic.in. Check out the complete details of Maharashtra SSC 2018 Toppers List, Topper Answer Sheet Copies, Division Wise Toppers, Subject Wise Toppers, Topper Name and Details, Merit List District Wise, Result Analysis, and also check the pass percentage details from the below article. After the declaration of the SSC Board 10th results, The board will also release the Merit list of Maharashtra Board Class X Exams according to School Wise, Subject Wise, Divison Wise and District Wise. 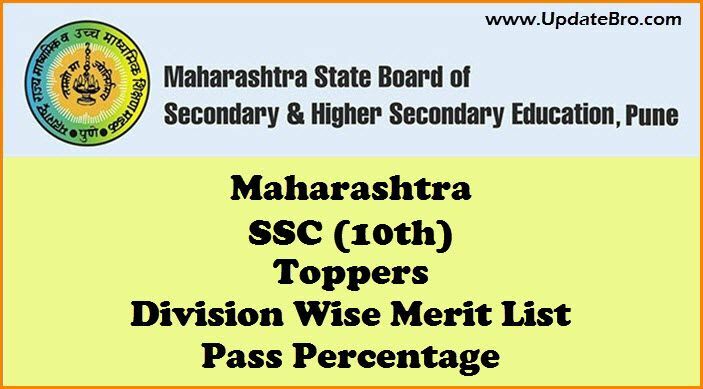 The overall pass percentage of Maharashtra SSC is 89.41 percent. Girls have outshone boys, girls (91.17 per cent) and boys (87.27 per cent) passed the exams. Out of 17 lakh students in the state, 1.8 lakh failed in less than three subjects and have been allowed to keep term (ATKT). Around 48, 570 students secured above 90%. Out of the 16,50,499 students (fresh candidates) who registered for the Maharashtra 2017 SSC exams, 16,44,016 students actually appeared for the exams, out of which 14,58,855 students have passed. The Maharashtra Board of Secondary and Higher Secondary Education (MSBSHSE) were announced with pass percentage of 88.74%, (Girls: 91.46%, Boys 86.51%). A total of 193 students have scored a perfect 100 per cent in the Secondary School Certificate (SSC) exam. The reason why they have scored high is the 25 extra marks given for their performance in sports, arts and culture. Aboli Borase scored 100 per cent. Shrawani Dumbre who scored 97% in the 10th class of SSC board. In the year 2016, a total of 16,07, 411 lakh students (including repeaters) from across the state, had registered for the SSC exams. Out of which 16,01,406 appeared for the Maharashtra Board SSC Exam 2016 through the nine divisions in the state. In 2016, MSBSHSE had said that pass percentage recorded overall was 89.56% and girls had outdone boys. The Maharashtra SSC (Class 10) results conducted through nine Divisional Boards, which are primarily located at Pune, Mumbai, Konkan, Nasik, Aurangabad, Kolhapur, Latur, Nagpur, Amravati, and Ratnagiri. The MSBSHSE board will also release the MAH Class 10 Merit list and Pass Percentage details regarding division wise. Check out the division wise toppers and percentage details from the below. Konkan region delivered the best result with an overall pass percent of 96.18 percent, followed by Kolhapur at 93.59 percent and Pune at 91.95. A total of 14,58,855 students appeared for the exam out of which, as many as 250562 students were from Pune. In Nagpur, a total of 174805 students have appeared out of which 146257 have passed with a passing percent at 83.67. The Konkan with the pass percentage of 96.56, was the top performing region amongst the nine divisions of Maharashtra Board. I want to know the topper of gondia district as well as nagpur division.